23-10, In the afternoon fighting and shelling on the outskirts of Donetsk continued, there were explosions in the direction of Yasinovataya. Junta artillery shelled Nizhnyaya Krinka, Kiev district. 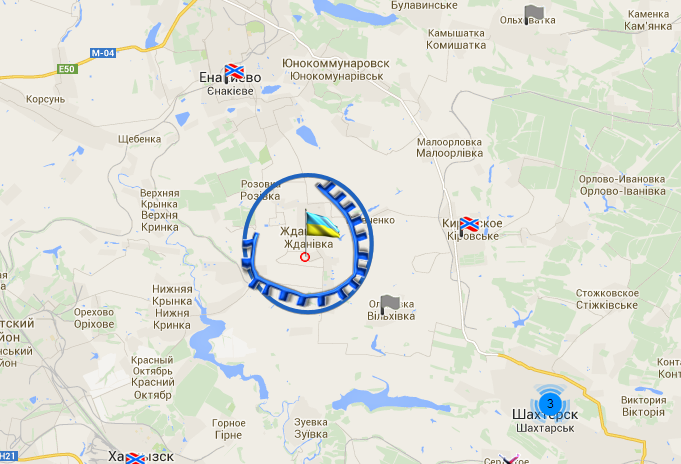 Heavy fighting continues under Yenakievo, near Yasinovka. The atmosphere is kept pretty tense. AFU were also defeated under Krasnodon. The border is now completely under the control of militia. 16-30, Situation: Offensive AFU activity decreases. DPR troops counterattack in key areas. 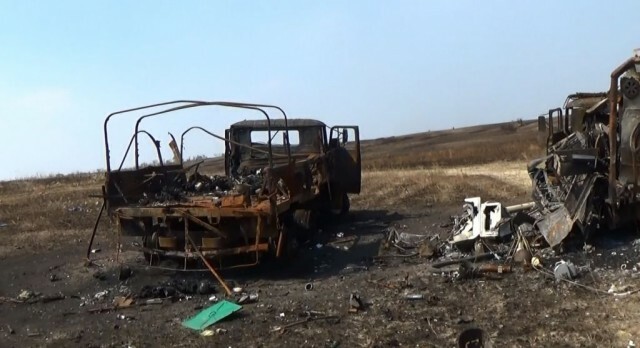 Persistent fighting took place in the settlement Grabskoye located near Ilovaysk, where the enemy used powerful weapon at militia. According to witnesses, these are tactical missiles "Tochka-U", as a result of which craters of depth of up to 8 meters formed. The use of rockets did not help punitive, who lost, according to the militia, about 130 people dead. Almost entirely the so-called "Black Hundred» was destroyed by in this pocket, where, according to the Ukrainian prisoners of war, brother of Yarosh had been fighting. 14-30, Unique video about the consequences of the defeat of the southern pocket of ATO forces. 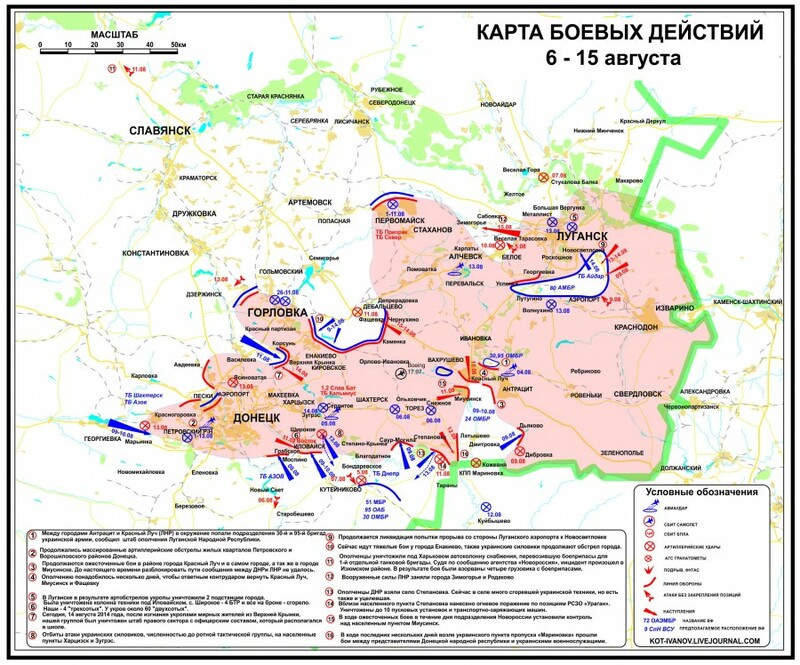 In "Southern pocket" units of the 24th, 79th, 72th mechanized brigades and 51-th separate tank brigade of the Armed Forces of Ukraine were defeated, out of 5000 surrounded only about 1 000 people broke through. Almost all of the military equipment lost. Ukrainian soldiers are switching en masse to the side of the DPR, said Prime Minister of the proclaimed republic Alexander Zakharchenko. 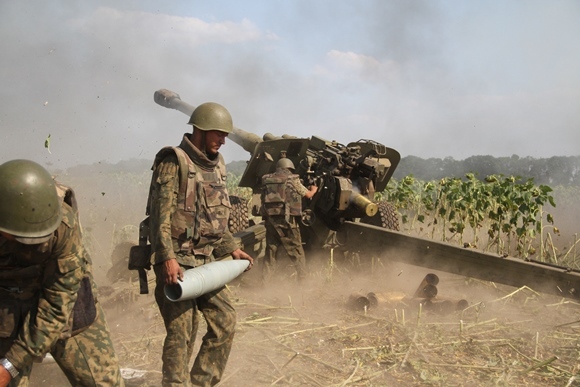 Militias of the unauthorized Donetsk People's Republic of New Russia declare that they destroyed one of the fortified areas where Ukrainian troops shelled residential areas of Donetsk. According to representatives of the militia, fortified area had a strong network of fortifications, including warehouses with lots of arms, more than a hundred boxes of used ammunition and missiles found. 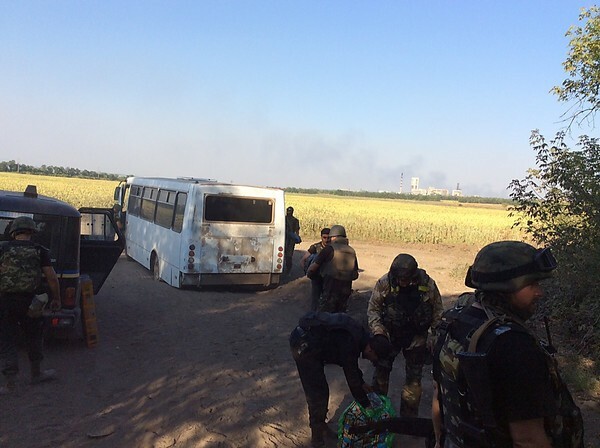 9-45, punitive battalion "Nikolaev" (sometimes called more ridiculous "Saint Nicholas"), on Saturday, August 16, returns to Nikolaev from the zone of the so-called anti-terrorist operation. The day before they came out of the combat zone and got in Novoaydar, where one of the bases of the Ukrainian army is situated. 9-34, Ukrainian artillery shelled Chervonogvardeysky district of the town Makeyevka of Donetsk republic. Chervonogvardeysky district of Makeevka shares a border with the city of Donetsk.